Friesens have printed 2900 copies of my book and it has done so well, I am down to having only 15 left. Could I live without any copies to share? I tried to imagine life without, and it felt empty. I told myself, “People can read their library’s copy,” or, “find one second hand”. When I checked on line the few books available cost more than my new ones. Furthermore, I had several future commitments who asked me to bring copies. Indecision ended when I decided, I’d do a fourth printing. I had another chance to make changes to the book and I should just buckle down and do the work. 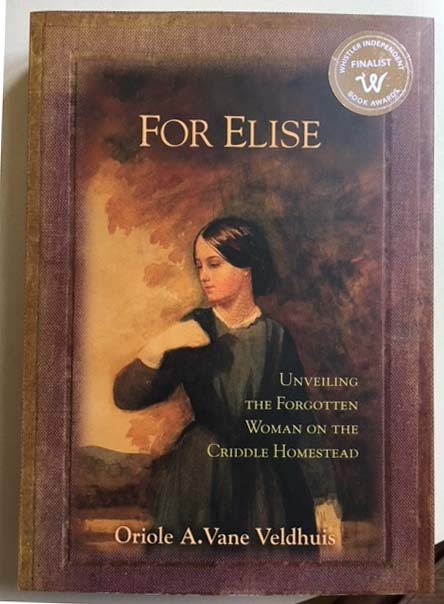 I have changed over the six years of living with my story and decided to take out a few pages from the ‘Sifting Out Elise’s Story’, and add some information about Percy Criddle, my Great Grandfather. I had all the information in my files, but with limited space could not include documentation. As I write, the 4th printing of ‘For Elise’ is going through the pre-press procedures. FedEx just delivered the proofs. Does anyone wish to come by check them out? If you noticed a mistake in the past, this is your chance to make sure it will not get printed again. I’ve done my best, but it’s a big book. Even at this late date changes can be made at $8.00 a page. I welcome you with your keen eyes. Let me know if you can lend an hour and I’ll make sure there is some vinarterta on hand to treat you. You will also get a preview of Percy Criddle’s family and life before coming to Manitoba. The date for delivery of the books is September 21.